Preheat the oven to 350F. Prepare a 6 cast iron skillet, small baking dish, or two or three ramekins by greasing with a bit of coconut oil and setting on a baking sheet.In a bowl, combine the sliced strawberries, maple syrup, vanilla extract, and tapioca flour. Stir to combine. Pour the fruit into the prepared pans, dividing evenly if using more than one ramekin. Dollop the almond butter on top, and toss gently to mix it in just slightly.In a different bowl, combine the ghee, almond butter, coconut flour, coconut sugar, cinnamon and salt. Mix until smooth and then crumble over the strawberry mixture. Bake for 30-35 minutes until the strawberries are bubbling and the crumble is firm and lightly browned. 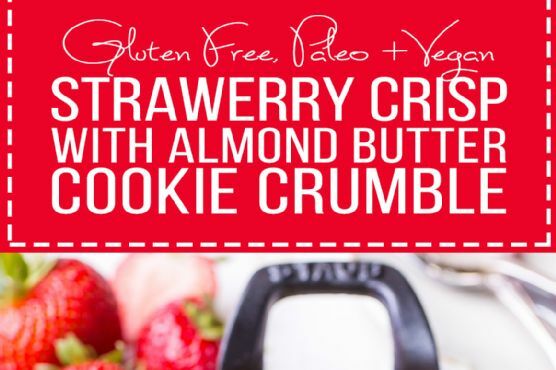 Serve with whipped coconut cream and a drizzle of almond butter. Cream Sherry, Moscato d'Asti, and Port are my top picks for Crisp. A common wine pairing rule is to make sure your wine is sweeter than your food. Delicate desserts go well with Moscato d'Asti, nutty desserts with cream sherry, and caramel or chocolate desserts pair well with port.